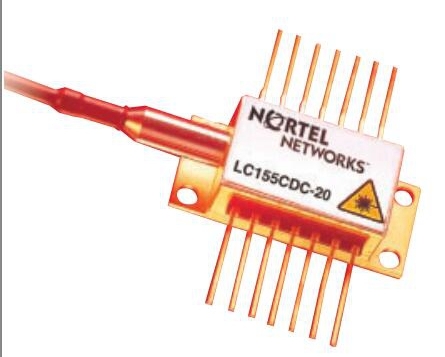 Offering 20mW CW output power, the LC155CDC is a wavelength stabilized DFB laser suitable for deployment in high speed, DWDM applications with 50 GHz channel spacing. Incorporating an FP etalon and two monitor photodiodes, The LC155CD.may be locked to the ITU grid and will maintain wavelength within ±20pm. The laser is supplied in a 14 Pin butterfly package which incorporates a PIN Fibre Pigtail (Fujikura PANDA type). allows wavelength stabilized operation to within ±20pm over life. ITU wavelengths available from 1530nm to 1560nm. InGaAsP Distributed Feedback (DFB)single frequency laser chip. Polarization maintaining single mode fibre. Hermetically sealed 14 pin butterfly package with optical isolator. Integral thermo-electric cooler with precision thermistor.